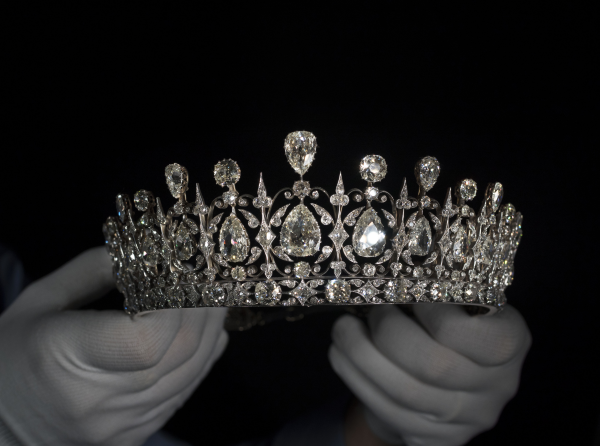 The magnificent Fife Tiara, which has a new home at Kensington Palace, is impressive enough in photographs, but when you see it in motion, it really comes alive. Today, we've got some excellent views of the tiara's movement, as well as the way that parts of the jewel are designed. Enjoy! The movement of the pendant diamonds is especially apparent in these images. Can you imagine how much it would tremble and sparkle when worn by a person? Photo generously shared by Marion. DO NOT REPRODUCE. 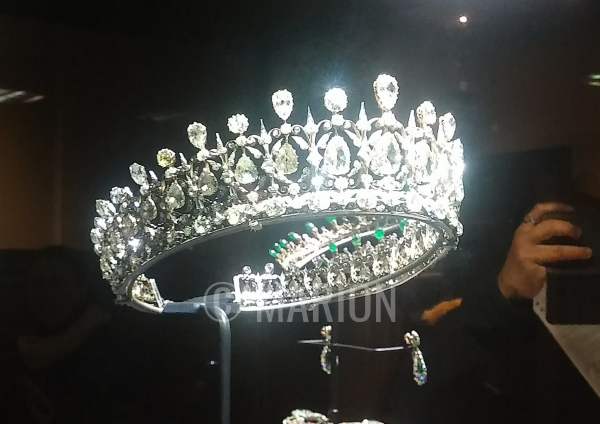 I've heard from many of you who have attended the exhibition so far, and one lovely reader, Marion, sent along some photos and thoughts about the display: "One can get up really close to the glass and the tiaras are only a few inches away. There weren't many people today so one could hang around taking as many photos as one wanted. The reflections in the glass allowed people to take pictures of friends and family on the other side of the case and if they positioned themselves right, it looked like the reflected tiara was sitting on the person's head! I was by myself, so I couldn't indulge in that fantasy! You can probably see the reflection of other people to get the idea. The larger Fife tiara is astounding! Such big diamonds and they are constantly moving from the people just walking around shaking the case." And, maybe my favorite detail of all: "There were nose prints on the glass!" Thanks so much for sharing your experience, Marion!